Soya nuggets and TVP , features regularly in our Menu at Home. We just love this meaty protein and I try to incorporate these in our meals in variety of way.Tikkis stuffed with TVP, Soya nuggets Pulao, Soya chunks in tomato gravy and also in simple Onion gravy (Recipe I) or restaurant like rich creamy gravy. But my quest for yet another way to cook Nuggets, make me wander in the virtual world of Food blogs, Food Websites, along with pestering my friends (Some of these are established Chefs while some, in making of being a great Chef) who are really good in cooking lip smacking food. I try to jot down all the tips and tricks of cooking, from these lovely friends, and hence bring about a huge change in my cooking style, be it in terms of flavors, taste, aroma or texture. My new neighbor is an excellent cook (Coming up next, will be her awesome Pahadi Aloo recipe) and like good neighbors we keep on sharing the food and recipes too. The following recipe of Soya Nuggets is partly inspired by her style of making gravy, partly by the tips shared by some friends, partly by my own instincts ..so its kinda hotch potch of recipes, but trust me when I say, this will work for you at any cost. Soak nuggets in warm water to which salt is added, for at least 30 minutes. In the meantime, take a pan or pressure cooker and add generously 2 tablespoons of oil.Do not panic...we will drain out all the excess oil after frying the onions..so chill ! Add Akha Garam masala and let these sizzle in oil for few seconds. Add chopped onions, and saute on medium to high flame till onion turns nice golden brown color. Now drain out excess oil, add crushed ginger and garlic (you can use paste too) and saute for few more seconds. Add grated or chopped tomatoes, green chillies, salt (remember there is already some in soaked nuggets) turmeric powder and fry well. When tomatoes are about to cook, add drained and squeezed Soya Nuggets to the cooked mixture, add coriander powder and Bhuno for 2 minutes.Sprinkle some water if mixture tends to stick to the bottom. Add around 2 cups of water and let the nuggets cook for 15 minutes if using pan (close it with lid and simmer after few boils) or for 5 whistles, if using pressure cooker. You can sprinkle some garam masala powder almost at the end of cooking procedure. Adjust the seasoning and let it simmer for a while. 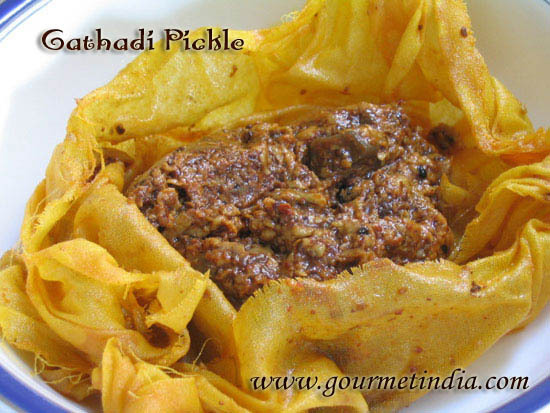 Garnish with coriander leaves and serve with either Roti or rice or both. UPDATE: With great anxiety, let me share something with you all….Lovely Ria of Riascollection have chosen SindhiRasoi for Tried and Tasted Event for September month. 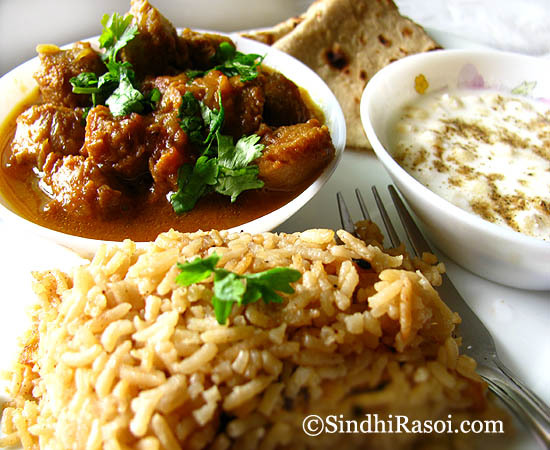 This means that Bloggers and non bloggers can choose any recipe from Sindhirasoi and try it out. Bloggers can blog about it on their respective blogs while non-bloggers can just click the pictures and E-Mail their experience/verdict to Ria. I am super excited and really nervous….but please note, you can give me a shout or write to me (Use this contact form ) in case of any doubt about the recipe. Confused about some ingredients? Unable to follow any method? Need to ask about any substitutes? Just anything…and I will be more than happy to help ! Hoping of less disasters and more wonders in your kitchens…Will you participate in the event ? Thanks once again Ria..you really surprised me ! 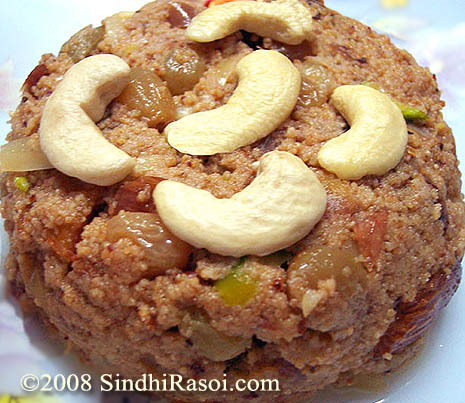 Keep posting our Sindhi recipes ??? My recipe did not turn out like the red gravy of yours. Also the soya soaked all the water. So it became dry. Did I miss out on something?? just cooking it lest c if it tastes the same as it look mouth watery…loluth watery lol…. wonderful recipy.. yummy!!! thanks buddy. 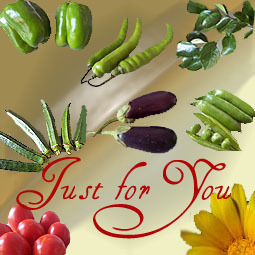 LIKE YOU….. & GOD BLESS YOU.@. Alka, I made this curry couple of days ago and it turned out great! Will blog about it in a day or two. Thanks for sharing the recipe! this one is my favourite , I add soya nuggets to bhugha chaval , it tastes good in rice too. Wow Lovely recipe. Will surely try. I usually add potatoes to this one. But, seems like even without that, it looks wonderful. I am drooling all over Alka. Got some soy nuggets at home. Can’t wait to try this. Might be this will be my first entry for T&T. 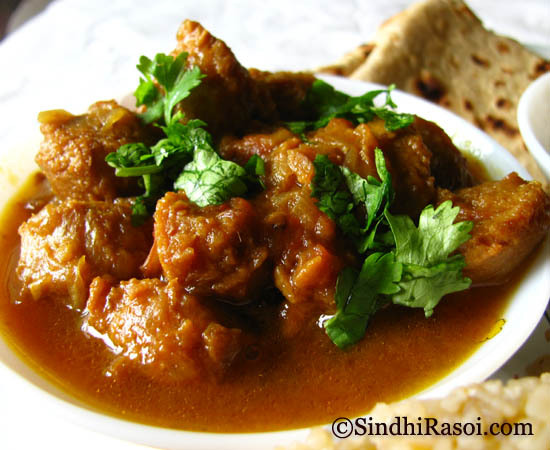 Really appreciate your efforts posting the home style sindhi recipes. Looks great Alka..though I don’t eat these chunks as it reminds me of meat..LOL! Recipe is grt and will definitely try it. even i prepared soya curry today for dinner,…ur platter looks so yummy,. Another Gem, realy very tasty,very easy to prepare recipe tried and made today came out so well,it was a treat. Oh how i wish i had this for my lunch or dinner. Looks so so yumm. great curry, looking forward to make it.